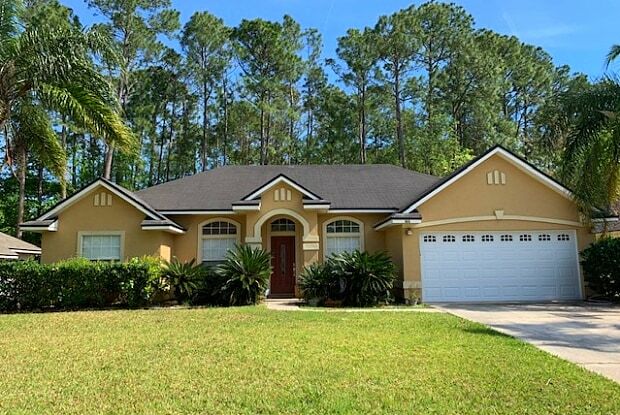 Beautifully maintained home in The Parkes of Julington Creek Plantation. Four bedrooms and two baths. Kitchen with granite counters, gorgeous cabinets and stainless steel appliances.Master bath with garden tub and separate shower has upgraded vanity, lights and framed mirror. Hall bath with granite counter and framed mirror. Formal living and dining rooms off the foyer plus family room. Tile floors except in bedrooms. Nice yard backs up to preserve area. Lawn/shrub maintenance included in rent. HOA rules apply to tenant(s). Tenant allowed use of JCP Amenities. Tenant to pay a $100 processing fee prior to lease signing. Have a question for 163 Elmwood Dr?